HOUSTON And REYKJAVIK, Iceland, Nov. 2, 2018 /PRNewswire/ -- Icelandair will integrate FlightAware's Firehose data feed to enhance their existing operational tools with global flight tracking. The feed will deliver live aircraft position data from FlightAware's terrestrial network of ADS-B receivers, as well as from Aireon's space-based ADS-B network. 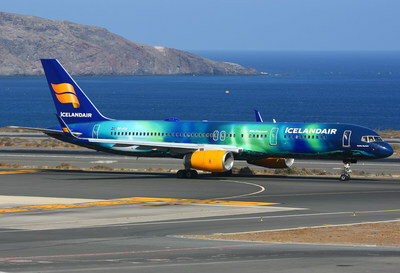 Icelandair joins airlines around the world in taking steps to modernize their flight tracking capabilities. Largely in response to the loss of flights AF447 and MH370, the International Civil Aviation Organization (ICAO), which is a United Nations specialized agency, created the Global Aeronautical Distress Safety System or "GADSS". GADSS establishes standards and recommended practices for flight tracking by aircraft operators and has been adopted by the European Aviation Safety Agency (EASA). "Icelandair is unique in the sense that 100% of their routes fly over remote bodies of water where precise flight tracking hasn't been feasible until now," said Max Tribolet, Director of Business Development for FlightAware. "Augmenting FlightAware's terrestrial ADS-B coverage with Aireon's space-based ADS-B network will ensure position updates of at least once-per-minute anywhere in the world. This means that Icelandair will far outperform the GADSS standard for normal conditions and will proactively meet the 2021 recommendation for tracking aircraft in distress." FlightAware's terrestrial network, which consists of over 20,000 ground stations around the world, provides position updates multiple times per minute for aircraft flying over land. This network also captures aircraft movement on the ground with position updates every second. Through partnership with Aireon, FlightAware's feed includes space-based ADS-B coverage as well. Aireon's space-based ADS-B network, which is hosted on the Iridium ® NEXT constellation, will eliminate coverage gaps over oceans, polar regions and other remote areas with position updates at least every minute. Because ADS-B OUT is mandated throughout the world, the vast majority of airlines â€“ including Icelandair â€“ do not need to install any additional equipment to be tracked on these networks. "While Iceland's geographical location between North America and Europe has proved to be strategic for building international routes, it has also presented challenges for tracking our aircraft until now," says Captain Haukur Reynisson, Director of Flight Operations at Icelandair. "By integrating live flight tracking data from FlightAware, Icelandair gains incredible situational awareness that will drive operational optimization and reinforce passenger safety." FlightAware (FlightAware.com) is the world's largest flight tracking information company and provides over 10,000 aircraft operators and service companies as well as over 12 million passengers with global flight tracking solutions. FlightAware leverages data from air traffic control systems in over 45 countries, from FlightAware's network of nearly 20,000 ADS-B ground stations in nearly 200 countries, from AireonSM space-based ADS-B and from global datalink providers. FlightAware is privately held with offices in Houston, New York and Singapore.